If you’re reading this blog and you’re a knitter from somewhere in the vicinity of southern Ontario, I can only imagine that you must have been at the Knitter’s Frolic in Toronto, today, and therefore I feel I must apologize for stepping on your toe/bumping into you that one time/accidentally shoving you with my shoulder bag. 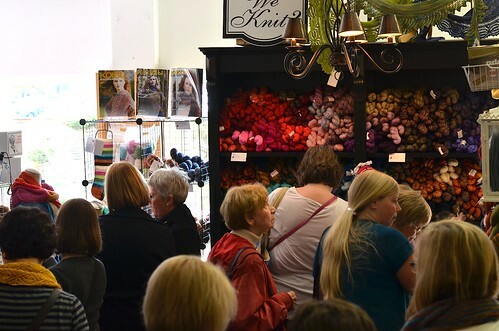 Wow there were a lot of us knitters crammed into that place, and even more yarn there to distract us beyond belief. Everyone made it out in one piece, right? Okay good. 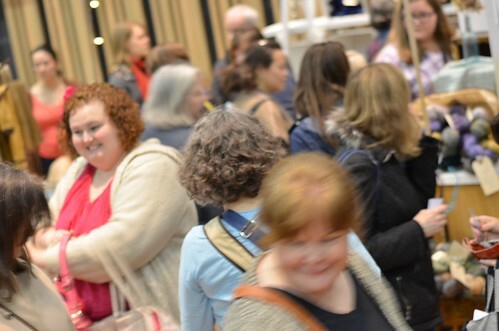 A sort of delighted but blurred knitting frenzy. It was a lovely time to see so many knitting friends (inasmuch as one can visit with knitting friends while trying to shop in five different places at once), and so for now I’ll just post a few pictures from the day – more later about my few delicious purchases! And my knitting continues to wait in the wings, and all those many works in progress still wait to be finished. I hope your weekend is knitterly and enjoyable, wherever you are! Clearly I need to visit Southern Ontario! Looks awesome! Yes, I won a prize! Yes, I saw many of those people! Yes, I’ll be back next year! 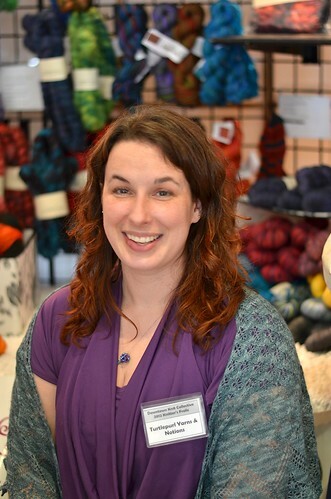 Knitter’s Frolic? Bought the tote bag! Wow, looks like I should make plans to go next year! Looks like a great time was had by all and all that yarn, all that great yarn! 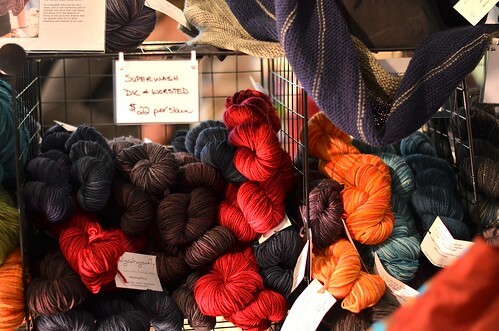 I’m reading your blog in France – your pictures are reminding me of my wonderful trip to the frolic when I still lived in Toronto – I MISS being around so much yarn & so many knitters. One can buy nearly 400 kinds of cheese here but yarn…. well, let’s just say the French haven’t quite cornered the market on it ! I try to explain to my few French knitterly friends just how big Romni Wools is & they can’t begin to imagine it. Knitting aside, I have just about everything else I could wish for here so I’ll just keep reading your blog to catch glimpses of delicious fibres ! Forgot to say that I also love your recent colour work projects. I have the same colour thoughts swimming in my head lately. Must be spring ! 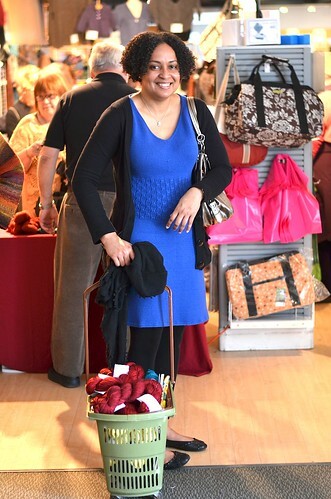 It was an awesome event…so many yarn choices!!! I wish they held such wonderful things here in Florida… in the mean time, I will live vicariously through you. I love that blue dress, but am in awe of that tiger sweater! Wow! Nothing like that even close to Oklahoma! I just wanna know how much money ya spend! I was there too. I go every year with my mother. It’s so much fun to have SO much yarn at my fingertips! I just wish they’d open some doors to let in the cooler air! Awwwww! I am so sorry I missed this. Clearly, I need to do some research into local events. 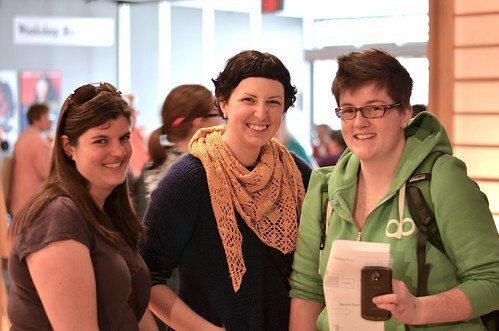 Wow there are alot of knitters in Toronto ….I’m impressed! 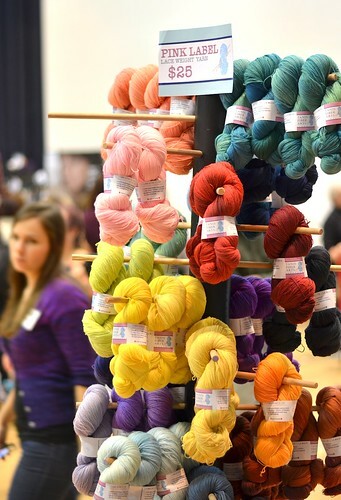 Look at all of that yarn! And all of those knitters! I’m going to start planning a knit-cation! Now this is what I miss most about Toronto! I even see someone that I recognize in one of those shots. 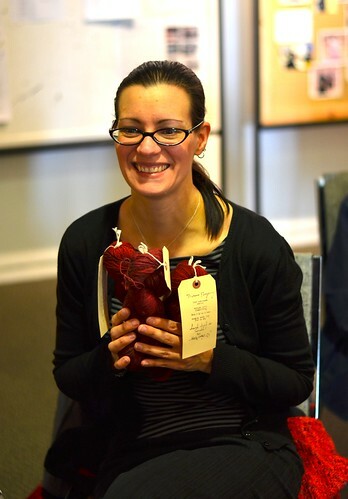 It’s wonderful to live vicariously through your yarny adventures. Can you tell me where this took place so I can go next year? I’m not from Toronto but if you tell me the street and avenue name I should be able to figure it out. Ha! I hadn’t realized how much taller Bridget and Sasha are than me 😉 It was lots of fun and great to see all three of you! 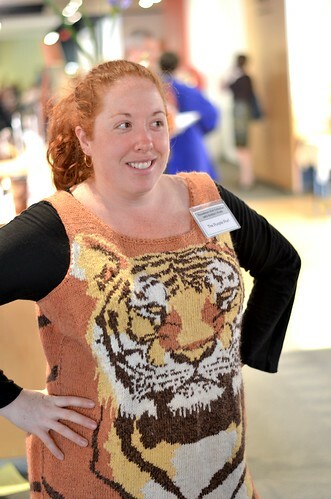 looks like you had fun and HOLY Cow that tiger tunic is ah-maze-ing! It was so good to meet you in real life (and my toes are just fine, no worries:)). 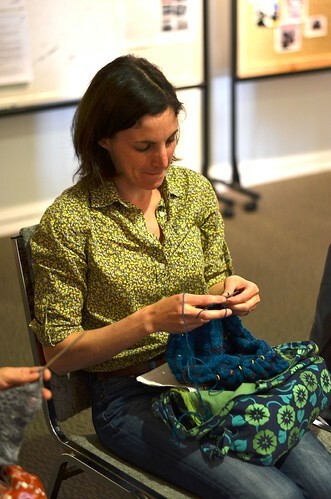 Funny to see myself knitting! If anything happens to me before I pick up the needles again, that picture captures the last time I ever knitted (how’s that for macabre?) Take care! See you next year!